If your domain is not using DreamHost's nameservers, the mail-related DNS records will not be automatically active for the domain. You'll need to manually set up those records at the host where your domain's DNS is managed. You can verify where your nameservers are pointed at http://whoisweb.dreamhost.com. 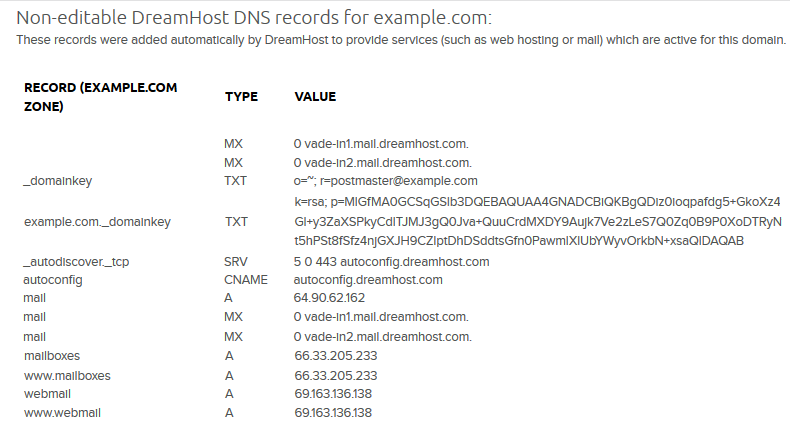 All the mail-related DNS records are automatically created in the DreamHost panel when a domain has email addresses set up on the Manage Email page. You can find your Mail DNS records on the Manage Domains page. Click the ‘DNS’ link under the domain to view your records. Please note that the records below are only examples. Your specific DNS records will be different. There are two types of mail-related DNS records. tells senders where emails for you should be delivered to. used by your mail program when you connect to the mail server to view your inbox or send out emails. There are several mail A records for your domain. _domainkey DKIM records sign emails to help verify the sender. _autodiscover._tcp (SRV) 5 0 443 autoconfig.dreamhost.com — This is an SRV record that assists email applications automatically configure the correct settings. autoconfig (CNAME) autoconfig.dreamhost.com — This is a CNAME record that assists email applications automatically configure the correct settings. *mail. (A) 64.90.62.162 — This is a standard subdomain that can be used to connect your client or program to the mail server. If Spam filtering was not enabled, you'd see mx1.dreamhost.com and mx2.dreamhost.com. *mailboxes. (A) 66.33.205.233 — This is used to log into the DreamHost Mailboxes interface. *www.mailboxes. (A) 66.33.205.233 — This is used to log into the DreamHost Mailboxes interface. *webmail. (A) 69.163.136.138 — This is used to log into the DreamHost webmail panel. *www.webmail. (A) 69.163.136.138 — This is used to log into the DreamHost webmail panel. Enter all those records in to the system where the domain's DNS is hosted and managed. After you make the DNS adjustment, it will then take several hours for the changes to update online due to DNS propagation. Article last updated April 11, 2019 16:05 PST.